A joint European project called UpWind has announced that new technologies will allow engineers and scientists need to start producing wind turbines with 20 megawatt (MW) capacities — that’s enough to power 16,000 to 20,000 homes with a single turbine. Currently the largest wind turbines that have been built have a 5 or 6 MW capacity, and engineers involved in the UpWind project are working on solutions to make larger turbines more cost competitive with those on the market now. They believe the answer lies in laser technology and turbines that move like the flaps of an airplane. Up until recently it was thought that 20 MW wind turbines were physically and economically impossible to build. The European Union wanted to know if that was truly the case, so they gave $33 million to a team led by the Risø National Laboratory for Sustainable Energy at the Technical University of Denmark (Risø DTU). The scientific collaboration has now revealed their results, and though they believe that building a 20 MW turbine today would be cost prohibitive — it would cost 15 to 20 percent more than today’s turbines — they have found technology that will bring that cost down to a feasible level. One of the new technologies involves making the blades of the turbines “smart” — essentially, this means that the trailing edge of the turbine would move like the wings of an airplane to catch more wind. The engineers involved in UpWind also recommend the installation and use of LIDAR technology, which measures wind velocity and intensity with lasers. This technology is more efficient at measuring wind than our current option, an anemometer, and it could be integrated into the nose of a turbine to help correctly control the trailing edge movement. Previously these technologies were thought to be too expensive to install in small wind turbines, but when you up the size, the cost benefits level out and larger turbines become a more viable option. 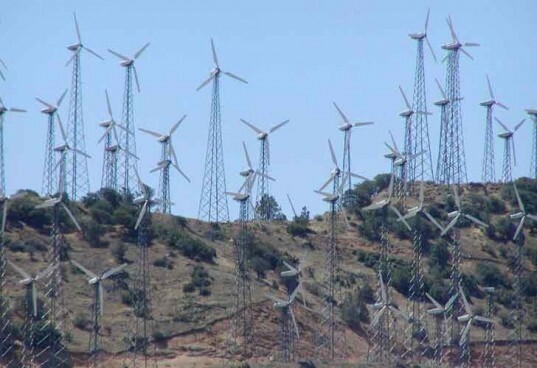 ok 1) the wind turbine can be raised from the ground, problem solved. 2)the efficiency is diminished because when wind pushes the paddles to make it turn they push both sides meaning its pushing one side to go and one side to stop. so either place a wind barrier in front of one side to stop the wind pushing the other side of the turbine and you can funnel the wind towards the place u want it. http://magturbine.com/ (problem solved) 3) number 2 solves this because it funnels wind towards where u want it to blow and stops it from slowing the machine down. 4)the machine needs guy wires because its based on the Darrieus Machine which is an egg beater type turbine. It needs the guy wires because as the propeller rotates it feels different different forces that are unequal. this means as its going around its weak at one part and strong at another causing it to wobble as the force isn't constant. wasn't really a problem with the wind turbine i was talking about 5) i dont know if u looked at the website i sent about maglev wind but they don't have this problem. its floating on air and the whole point behind it is to reduce friction thus reduce maintenance. All im trying to say is that all these minor problems are fixable. isn't there any problem solvers left on this planet. Advantages can also be added to this to make the vertical axis wind turbine the best thing to use. Now all we need is someone with money and the understanding of efficiency. I know THE GERMANS.